If you are unfamiliar with Antenna Magus it is recommended that you briefly familiarize yourself with the basic layout of the user interface before continuing with other application notes. A description of the main areas in user interface is given below. Ribbon - Offers Access to commonly used tools and operations. It also allows the user to switch between different modes in the application. Palette - The palette consists of expanders that generally follow workflow of the application, however, strict adherence to this workflow is not required. The expanders generally consist of parameters and operations. 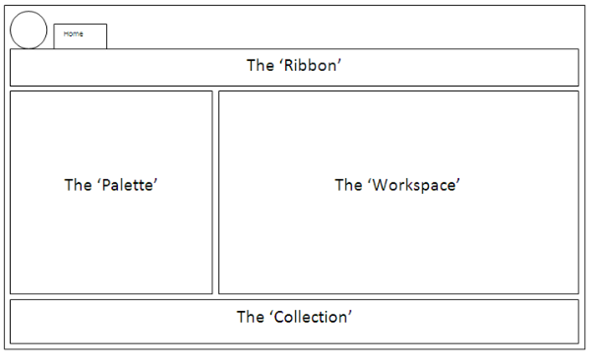 Workspace - Typically displays results and additional information. Here the user is able to view and refine results. Collections - Consists of the user's antenna prototypes.